Driving into the city today on E. North St. I noticed a "plan" taped to the vacant ugly building in the crummy looking lot at the corner of stone ave and E. North st. across from the firehouse. where I some times see a guy selling bonsai plants. That lot is in rough shape! looks horrible. I wasnt able to pull over and look at the plan taped to the window. Hopefully they rip up all that asphalt and teardown that building. and put something nice there. although its dificult for vehicles to pull in and out from that location with all the traffic on Stone and E north. anybody know whats going on there? I believe its part of the properties owned by Town Gate LLC. Haven't seen anything in terms of a plan for the site. Is that the old clock? Here is the location from Google Earth, if that helps. Is that a small park behind the site? It would be nice if that could be incorporated into the project, whatever it is. That lot is prone to flooding. More than once I've seen that building partially submerged. Yes, I've seen some pretty bad flooding in that area. It's one of the low points in the city street wise, at the intersection of some creeks that feed into the Reedy. That spot would be on the bottom of my list if I was going to locate a business anywhere in the city (one reason I like the "hilltop" location I am moving into now). If any spot in the city should be "regreened" with trees and/or other folliage it would be that spot. It's not that it's a bad location "business-wise" but it's pretty bad as far as geography goes if that makes any sense. I understand that it is considered to be in a floodplain, that wretched old building hasn't been torn down because they can't rebuild there. You'd have to be a fool to move into a building that you know is, sooner or later, going to flood. That corner would make a good green area or park. That side of Stone Avenue up to Column St. (Capri's) is pretty rough - I wouldn't mind seeing a bulldozer make a run from E. North all the way to Column. That corner would make a good green area or park. 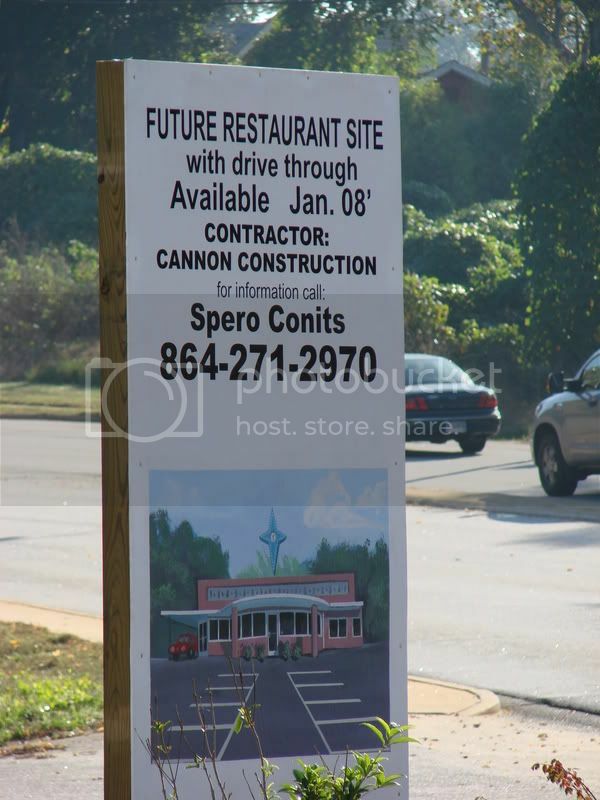 I noticed this morning that there's a public hearing sign in front of the restaurant at Stone and Park/E.North Street. Anyone know what that's about? I have some great stories about that Clock being renovated but no time to tell them, maybe later today. I've been wondering why that lot has stayed empty so long. Seems like a perfect place for a drive-thru coffee place (I know they have that stand-alone thing there now, but I'm thinking Starbucks or DD, something like that). The flooding kind of explains the problem. Plus, I think access might be a problem--that's a pretty busy intersection. I heard that this was a pretty dangerous Clock back in its day. That it was a hang out to a few greaser gangs. One time a brawl broker out and spilled outside and then it moved to the Sear's parking lot (Canal insurance today) and that a Tommy Gun was pulled out and a number of people were killed. This sign is up on the property. Sounds like no specific restaurant tenant is lined up. Still nice to see this property redeveloped. Tasty. Me want! Me want! Ahhh...thanks for the clarification. I know that I'm going to have a massive heart attack when I come back down because my eating habits are going to change. Speaking of which... those who have lived up here in Boston, how do you think a Know Fat or Fresh City would work in Greenville? Just throwing that out there. Construction has started on the Old Clock. 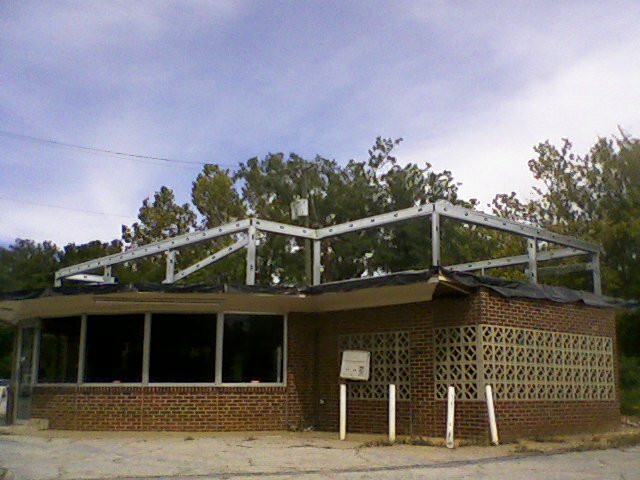 I've been waiting for this place to get some TLC! I'm so glad it's re-opening as the Clock again! I was sad when it closed.